When America's Industrial Revolution was in full effect, America's black population was being effectively ostracized from benefiting economically because of rampant racism, oppression, and tactics developed to ensure white supremacist control of those economic gains. Jim Crow, Jane Crow, Uncle Crow, Aunt Crow, Daddy, and Mama Crow ensured that when the uptick in the American economy renewed itself during the period before and after World War Two the black populace would be certainly unable to progress economically as well. It seemed that during all the periods when might and prosperity of America were running on all gears of massive economic growth, black Americans were facing preset societal challenges that deterred our communities was truly benefitting during our nation's wealth building. We have seemingly been attached to the bottom rung of America's economic totem pole forever. 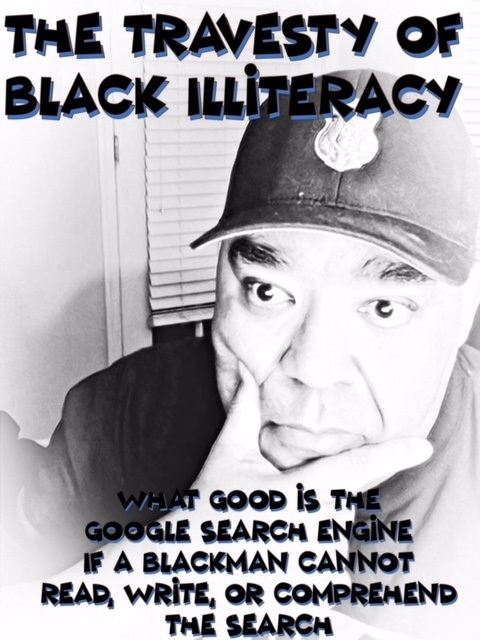 Now, America is in the midst of the greatest period of informational technological progression ever and again over 1/2 of our black population is effectively shutout because of as simple of a skill as literacy. If you cannot read in today's world of codes, bits, ciphers, and specific informational scientific terms that control the flow of data in today and tomorrow's world of economic growth; you will indeed be saddled permanently to the position of abject poverty. The only way out for the vast majority of our black community is being able to master a round or oblong ball, stringing rhymes together, or committing crimes directly at your brothers and sisters who are oppressed along with you. I've been told you don't have to be able to read to pull a trigger. That's the travesty of black illiteracy that is like a deadly virus killing off hope and opportunity in our poorest and most educationally disadvantaged communities. So many of our young brothers and sisters have hope cut off because they were allowed to exit our schools with that illiteracy stigma attached to them. It's a stigma that cannot be erased once labeled unless that person is willing to admit it was infected. Then, that virus must be eradicated with the personal fortitude to gained what should have been provided before puberty. We cannot continue to allow 1/2 of our population to waste away because of an inability to read. Nor, can continue to allow our young black children to be infected with this disease of illiteracy. Because if we do we are forever destined to be saddled at the bottom rung of America's economic and technologically advanced society. So as a close friend of mine always says pick up a damn book why don't you, and read it yourself, and then if necessary, and it is definitely necessary read it to others. Once you finish that book, pick up another.